WORSHIP—no act is more central to the Christian life. It gives rhythm and structure to the Christian’s life; it is the heartbeat of congregational life. Worship is the first act of a new church, and in hard times, it’s the last “program” to be cut—and when cut, the congregation passes away. Of course, Christian worship didn’t begin last year. We’ve been worshiping Christ for a couple of thousand years. Some of what we have done is impressive. When I was a pastor, in fact, I got the tradition bug, especially when it came to worship. I revered anything old: old hymns, old symbols, and especially old prayers. And I left caution in the narthex when I found a worship practice that came from the early church. These days, I no longer give the early church canonical status. Old isn’t necessarily beautiful. Some early Christians, for instance, did some odd things, like baptize for the dead or get drunk at the love feast. Then again, the early church did some brilliant things, like regularly including Communion, the Scriptures, and the sermon in worship. And the early Christians accomplished the incredible feat of maintaining these key traditions in the face of persecution, heresy, and the increasing dispersion of the church through Europe, Africa, and Asia. So I can’t shake my deep respect for those second-, third-, and fourth-generation Christians. They are, after all, closest to the apostles and our Lord, closest to the source from which all later streams flow. The rich cadence of a prayer from The Didache or an austere description of a worship service in the age of Marcus Aurelius can transport me back to the misty beginnings, when the Spirit of God brooded over the waters, when all things were made new. Apparently, you, our readers, feel the same fascination with the early church’s worship. A year ago, we asked which themes most interested you. 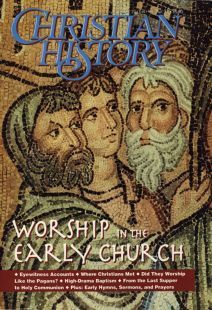 “Worship in the early church” topped the charts. In preparing this issue, we were left with questions. For example, how did women participate in worship? The evidence about their role in worship is scant. In fact, in general, we have little evidence describing early Christian worship. So we decided to reprint important original documents from which scholars have to draw so much. This issue takes us from the New Testament to the reign of Roman emperor Constantine (312–337), although at times our cup runneth a little further. Our goal is to give you a feel for Christian worship in its earliest forms.